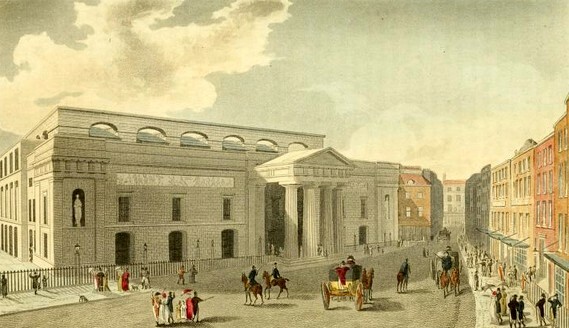 The Theatre Royal, Covent Garden, was one of only two theatres licensed to perform plays in Georgian London. The other was the Theatre Royal, Drury Lane, and there was intense competition between the two. In addition, the Theatre Royal, Haymarket, had a limited patent that allowed it to perform plays during the summer. The first Theatre Royal, Covent Garden, opened in 1732. It was built by the actor John Rich, the manager of The Duke’s Company – one of the only two theatre companies then licensed to perform plays. 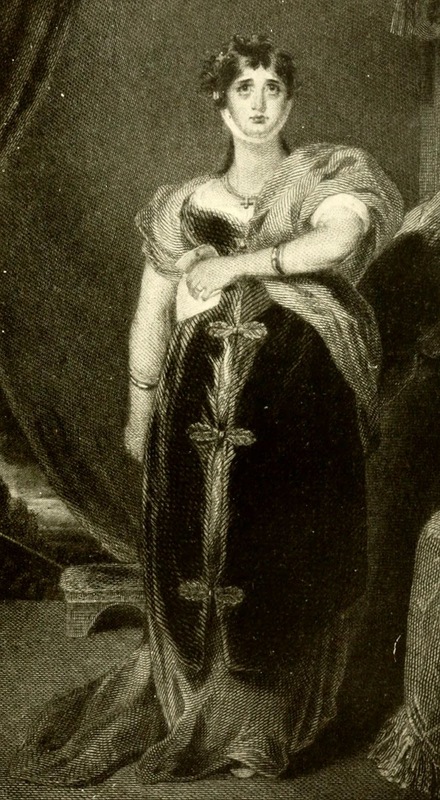 Rich had commissioned John Gay to write the highly successful The Beggar’s Opera and made sufficient money from the performances in Lincoln’s Inn Fields to invest in a new theatre building. 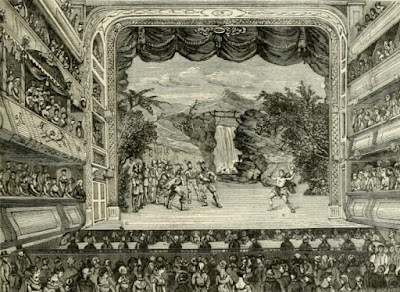 Rich moved his company and their licence to the newly completed Theatre Royal, Covent Garden, which opened on 7 December 1732 with a production of William Congreve’s The Way of the World. George Frideric Handel (1685-1759) was appointed musical director and many of his operas and oratorios were first performed at Covent Garden. In 1792, the stage-manager and part-owner Thomas Harris employed the architect Henry Holland to give the theatre a makeover. According to The Microcosm of London, Harris spent £25,000 on internal and external refurbishments. 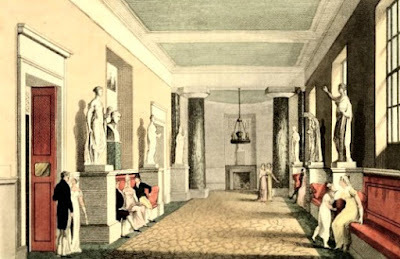 The principal entrance is in Bow-street, under an antique Doric portico, through a large and spacious saloon, handsomely fitted up and warmed by stoves, leading to the lower circle of boxes, and a double staircase that leads to the upper circles. The amphitheatre is entirely new, and contains three circles of boxes and a spacious gallery: the form is that of a truncated ellipse, or an egg flattened at one end; the effect of which upon the stage, and upon the sound (not always to be determined by rules) is certainly good. The front of the stage advances something more than the old one into the pit, and is in a straight line. The internal form of this building is that of a horse-shoe. It contains four tiers of boxes, that hold about twelve hundred persons; the fronts of which are painted white, bordered with gold and green, and the partitions are coloured in green, and relieved with a fanciful variety of bordering, which has a delicate and pleasing effect. The pit holds six hundred and thirty-two persons, is forty feet in breadth, and thirty-eight in depth, and contains twenty benches, which are so conveniently raised, as to give the audience a full view of every part of the stage. The principal lobby, or lounging-room, to this theatre, is of an octagon form, and is thirty-eight feet each way. In this place women attend with tea, coffee, and fruit. The private entrance for the royal family was through a large building in Hart-street ‘erected for the scene-painters, scene-rooms, green-room, dressing-room, &c.’2 The stage-door and box-office were also in Hart Street. 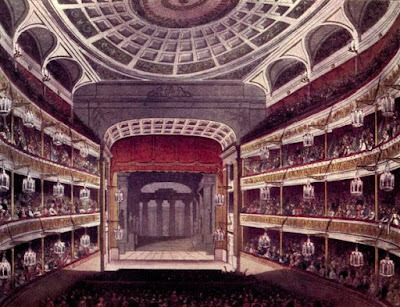 The theatre reopened on 17 September 1792 to scenes of heckling and disruption. The managers had raised the prices to the same level as Drury Lane Theatre to help cover the cost of the improvements and had failed to install a one-shilling gallery. As a result, the opening performances were interrupted by the audience’s noisy complaints. When the management promised to erect a one-shilling gallery as soon as possible, however, the opposition to the new prices dissolved. The doors opened at 5.30pm and the performance started at 6.30pm. People could be admitted for half price at the end of the third act of the play which, according to the The Picture of London (1809), was ‘generally a little after eight o’clock.’3 The Picture of London (1813) went into a little more detail, specifying that half-price began at the end of the third act of a five-act play but at the end of the second of a three-act play. 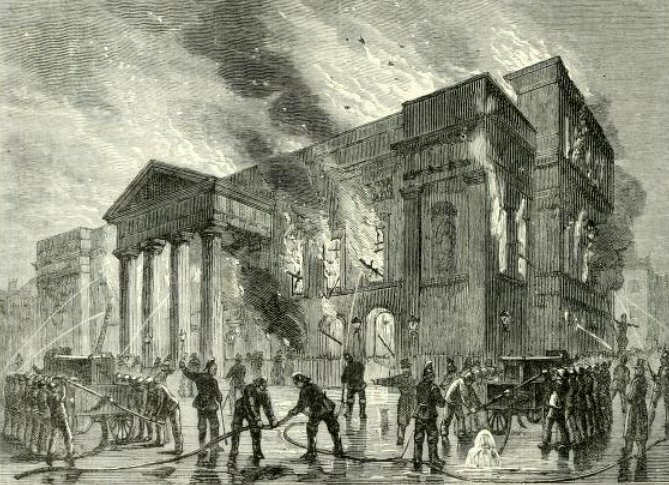 On 20 September 1808, the Theatre Royal, Covent Garden, was completely destroyed by fire. It was estimated that the loss of property was around £150,000 of which only £50,000 was covered by insurance. 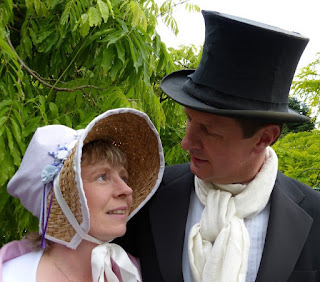 To raise sufficient funds to rebuild the theatre, the management issued subscription shares of £500 each. 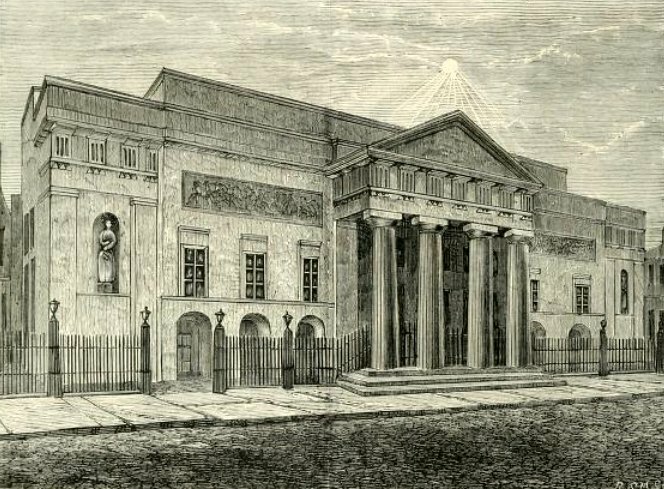 George, Prince of Wales, laid the foundation stone of the new theatre on 31 December 1808, and within ten months, the theatre was finished. Whilst the theatre was being rebuilt, the Covent Garden Theatre Company performed at the Opera House and then at the Haymarket Theatre. The principal entrance to the boxes is under the portico in Bow-street. On the left side of the vestibule is the grand staircase, which, with its landing, forms the central third part of an hall, divided longitudinally by two rows of insulated columns, coloured after porphyry. This leads to the anti-room, with porphyry pilasters, and a statue of Shakspeare on a pedestal. The doors on the right open into the box-lobby, which is decorated in a similar manner. There is another entrance from Covent-Garden, by a staircase with a double flight. The interior of the Theatre is rather larger than that of the late structure; and differs from those hitherto constructed, by approaching nearer to a circle. There are three circles of boxes, with a row of side-boxes above them, on a level with the two-shilling gallery. These upper side-boxes are without roof or canopy. Immediately behind them rise the slips, their fronts forming a perpendicular line with the back of the upper side-boxes. The one-shilling gallery in the center ranges with the fronts of the slips, the whole assuming the circular form, and upholding a range of arches, which support the circular ceiling : the latter is painted to imitate a cupola, in square compartments, in a light relief. The pannels are of a grey colour, with wreaths of honeysuckles, &c. in gold. The box fronts are perpendicular, and their ornaments are painted on canvas, and fixed on the fronts. Each circle is supported by slender reeded pillars, in burnished gold. The covering of the seats is of a light blue. 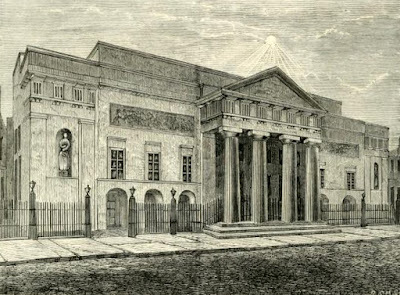 The new Covent Garden Theatre opened on 18 September 1809. In a desperate attempt to recoup some of the costs of rebuilding, the theatre management decided to increase the prices of the boxes from 6s to 7s and the pit from 3s 6d to 4s. This was a big mistake. The opening performance of Macbeth, with Mrs Siddons playing her iconic role of Lady Macbeth, was disrupted by the audience loudly protesting about the price increases. People also complained about the increased number of private boxes. This disruption lasted for around six weeks and became known as the ‘Old Price’ riots or OP War. The OP War finally ended when the management agreed to reduce the price of the pit back to the old price of 3s 6d and reduce the number of private boxes to the same as before. The theatre was redecorated and embellished in 1813. The main performers were contracted to the theatre for a period of three to five years, but the lesser performers were employed on a season to season basis. All the actors were paid weekly and subject to fines if they missed rehearsals or performances unless they were genuinely ill. 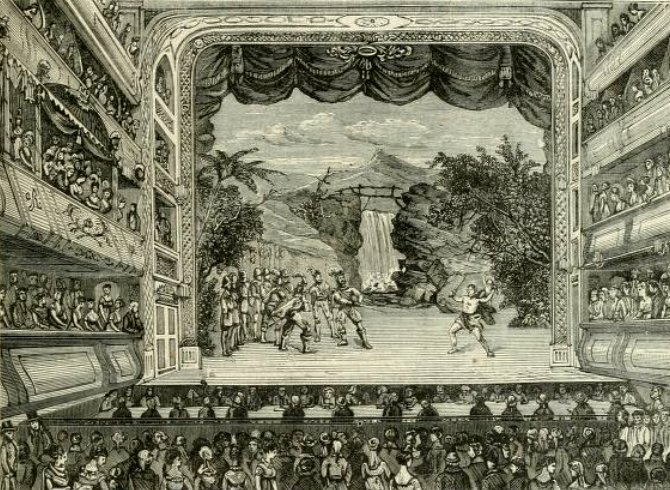 The Theatres Act was passed in 1843 breaking the monopoly of the patent theatres – Covent Garden and Drury Lane – and enabling other theatres to put on plays. 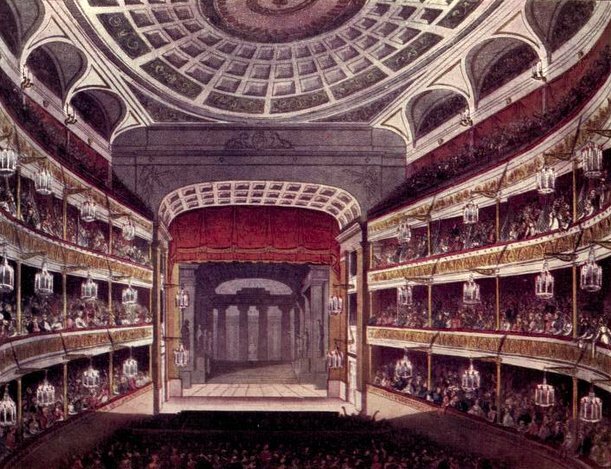 The Covent Garden Theatre was remodelled as the Royal Italian Opera House and reopened on 6 April 1847. However, it lasted for less than ten years in this form as the theatre was again burnt down on 5 March 1856. 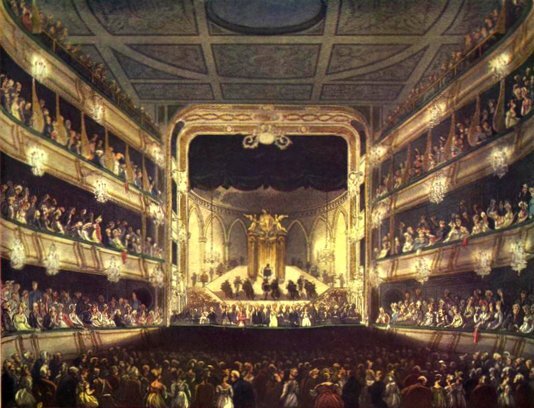 The new theatre opened on 15 May 1858 and this building remains at the centre of today’s Royal Opera House.